A lot of people appear to think it is not possible to make money with Constant Content. This is far from being the case. The site is also often considered to be a content mill, but again this is not true. To my understanding, content mills are sites, such as Triond and WikiNut, that entice writers to create content for them by promising a share of the revenue generated by the ads placed beside their content. Constant Content is not a revenue sharing website, it’s a marketplace that allows people to sell articles online and set their own price. Content mills would happily publish a laundry list if they thought it could make money and the quality of writing accepted is generally quite poor, but Constant Content has strict rules about grammar and punctuation. If your writing is not up to standard it will be rejected. The good news is the editor who has rejected your work normally tells you exactly what is wrong and how to fix it. The bad news is, if the majority of your work is rejected, Constant Content may close your account. This is something that would not happen with a content mill. Many webmasters and online marketers do not have the time or skill necessary to write quality content for their sites so they have to buy it. Constant Content is a marketplace that provides them with an opportunity to buy the articles they need. I will use affiliate marketing as an example. Affiliate marketers often build websites that are designed to encourage people to buy certain products or services. If the content on their sites is convincing enough, site visitors will click on the affiliate links or banners on their pages, go to the relevant website, and buy the product or service the affiliate marketer is promoting. This can be a very lucrative business. One of my clients, who works in the health and fitness niche, gets 40% of each sale every time one of his sites convinces someone to buy a bottle of diet pills. When the profits can be so high, many affiliate marketers do not mind paying for their content. In fact, sometimes when a marketer wants to build a new site as fast as possible they may buy a lot of articles at once. So if your online catalogue contains enough articles that are in the right niche it is possible to make multiple sales. 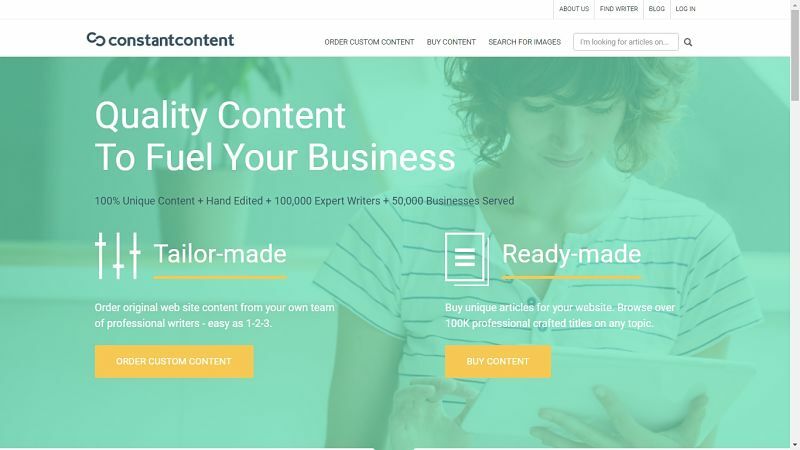 However, although it costs nothing to sign up and start writing for Constant Content, the site will take 35% of the money generated by each sale. So if you sell a 1000 word article for $100 your slice of the pie will be $65. Many writers may grumble about losing almost half of their earnings, but I do not mind because I am aware Constant Content are marketing my articles and finding customers. It’s a business and, like any business, there are overheads, such as web hosting. The content editors also need to be paid for the important service they provide. If a buyer is sufficiently impressed with a certain writer’s work they can send a private article request. When this occurs it is more like working directly for the client rather than putting articles up for sale. The payments are still allocated via Constant Content, though, so the normal fees still apply. 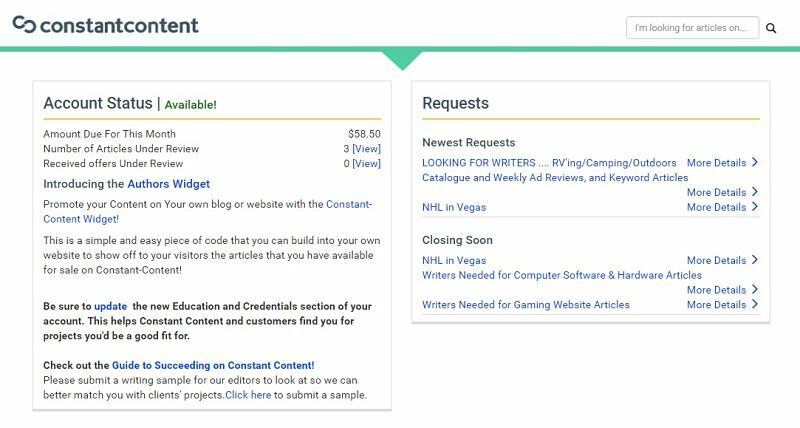 When a buyer contacts Constant Content and expresses a desire for articles on a specific subject, or is looking for a team of writers for a big project, Constant Content send out a “Casting Call Request” via email. It lets writers know the work is available and gives them a chance to apply. Sometimes the rates can be very good. At other times they are quite poor. It depends on how much the client is willing to pay and writers need to remember they will receive 65% of that figure, not the full amount. When I first began writing for Constant Content it was possible to sell three kinds of rights, but now there are only two. Usage Rights: This is the cheapest option for the buyer because they are only purchasing the right to use a specific article on their site. Writers receive less money for this kind of sale, but the same article can be sold a number of times, so the amount of money generated could be higher in the long-term. The terms of the Usage Rights licence do not allow the buyer to alter the article and it must be published under the name (or pen name) of the true author. Full Rights: This is the most expensive licence because buyers are purchasing the right to publish it under their own name and make any alterations they see fit. I have sold Usage Rights to several articles, but none of the articles generated multiple sales, so I prefer to sell Full Rights. Unfortunately, it is is not possible to submit an article without specifying a price for both rights, so I work out how much I want for the exclusive rights and enter the same figure for usage rights as well. That way I am sure I will get the amount of money I require for my work (presuming the article sells). How Fast Do Articles Sell on Constant Content? The sad fact is some articles don’t sell well, but they will remain in your online catalogue, so there is always the chance of a sale sooner or later. Even if it turns out they don’t make money on Constant Content, they may draw attention to your other work if buyers read them, like your style, and decide to check out what else you have available. At the other end of the scale, some articles sell very fast indeed, but it takes experience to know how to find such articles to write. If a subject is trending or very fitting for the present time of year, articles can sell quite fast but it can often take Constant Content a week to review an article and accept it. With very hot subjects the buzz may be gone before the article becomes available, so this is an important point to remember as well. However, to give an example from my own experience. I am an Amazon affiliate and, a few years ago, Amazon sent me an email about a new feature that allowed Twitter users to add items to their Amazon carts by including a hashtag within a tweet. I thought about how this new feature could benefit internet marketers, crafted an article, and submitted it to Constant Content. It sold a couple of days after it went live. Although it is possible to make money with Constant Content any time of the night or day (you never know when a sale may occur), it is only possible to pick up the cash once per month. The payday is usually the 2nd and the payments are made via PayPal. It’s easy for authors to check their balance because it is shown a the top of their writer’s dashboard. Although it doesn’t offer the security of a regular paycheck, it is possible to make money with Constant Content and, even though the site takes 35% of the proceeds from all sales, it is still better than many of the other sites that offer writers an opportunity to make money online. Not only does it beat the content mills, in some respects it is also better than many of job sites, such as Guru and Freelancer.com. It is ridiculous the pathetic rates that are offered for many of the projects posted on these sites. When you see people asking for 1000-word articles and stressing the need for perfect English, and then offering $2 per article, it’s a joke. Yet this kind of thing happens all the time. Constant content allows writers to set their own rates, but the lowest rate they allow is $7 per article. I’m not sure how many writers go that low, but I never do. I work my prices out by counting the number of words and then charging $00.05 to $00.10. Some people sell content for less, but there are others who appear to value their words higher and charge accordingly. If you are a writer looking for ways to supplement your income, I can recommend Constant Content, but it is important to think of it as means of gaining bonus cash from time to time rather than a main source of income.